Bedford Town manager Jon Taylor has revealed that the club has aspirations to reach the National South Division within the next five years. 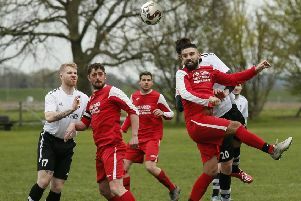 The Eagles narrowly missed out on a play-off place this term as a remarkable 16 game unbeaten run saw them climb the table after an unconvincing start to the season. Speaking exclusively to the Times & Citizen, Taylor explained his ambitions for the club, saying “For a town the size of Bedford, it’s quite poor that we’re not at a higher level. “We have a five-year plan where we ultimately want to reach the Conference South. “We’re a big town, and there are lots of smaller towns across the country who have teams playing in the Football League. “We’ll be looking to move as high up the pyramid as we can, but it must be sustainable. Taylor is under no illusions over the size of the task at hand, and recognises that reinforcements will be required to achieve their goals. Asked how many players he’ll be looking to recruit over the summer, Taylor was forthright when he said: “We need to build on what we’ve already got here. “Realistically I will be looking to sign another four to six players in key areas that we need to improve on. “I know what the league is about now and I’ve got good contacts in the game to bring players in. Whilst he’s aware that changes in personnel are required to progress, The Eagles’ boss was full of praise for his current crop of players. He added: “The reason that we’ve done so well is that we’ve now got an incredible group together. A lot of the players I signed at the beginning of the season came with a big reputation but didn’t deliver, so it was just a case of going back to the drawing board.